Lionbridge Jobs From Home – Flexible, Non-Phone Work! Published June 13, 2013 By Anna T. This post may contain affiliate links. Regardless, I only recommend sites I've researched and/or used and trust. Lionbridge has changed a lot since the last time I wrote about them, so I decided to write an updated post since so many of you are looking for non-phone work at home, and search engine evaluation certainly fits the bill for that. Lionbridge jobs are open worldwide and there are several different types. These are all independent contractor positions. What Lionbridge jobs are out there? I used to classify this is just search engine evaluation, but I should probably expand on that a little since there are so many different types of jobs. But search engine evaluation, if you aren't familiar, is generally comparing search engine search queries to ensure that the results that match up with them are relevant. I've never personally worked for Lionbridge, but I have done this kind of work for Leapforce, a similar company. You can read my full breakdown of what a search engine evaluator does here. Multimedia Judge – Determining the relevancy of video and images for search results. Internet Search Administrator – Improve search results by rating keyword and search term combinations. Speller Web Content Assessor – Help determine the best spelling for queries that are entered by users into search engines. Query Understanding Judge – Improve search results by rating keyword and search-term combinations. May include text, video, images, and adverts. Ad Assessor – Comparing user search engine queries and advertiser keywords with website landing pages, judging relevancy. Internet Crowd Worker – Capturing your opinions to ensure the best results possible are achieved and to make a difference to the user experience. Web Content Assessor – Same as other positions above, rating keyword and search term combinations. Internet Assessor – You get the opportunity to express your opinion on the quality and content of the web. Social Media Internet Assessor – Same as above, but with focus on social media. You can learn more about each position by visiting Lionbridge's work from home jobs page. You will notice that some of the positions only want people who speak a certain language, so look for that before you apply. Lionbridge keeps this information private and their workers must sign a non-disclosure agreement promising to keep pay details private, but I have heard it's around $13 an hour and up, probably depending on the specific job you're doing. Some of the positions are hourly pay while there are some others that are pay by the task. Lionbridge pays once per month. If you get at least 30 hours in for the month, you can expect to get paid by the 10th of each month. If you did not get 30 hours in, you will see your money around the 30th. Unless something has changed, I'm pretty sure they pay with direct deposit to your bank account. Yes. You can work up to 20 hours per week whenever it's convenient for you — provided they have work available. Keep in mind that sometimes they may not have work, so it could be scary to depend on this alone as your job, just in case. You'll have to take an exam, complete with study materials for you to look over. They will probably give you around one week to finish it. Then it will take some time for you to get your email saying you're “in” and start working. So the entire process of applying and then actually starting work at Lionbridge could take a couple of weeks. You need to be fluent in your language and also good at browsing the internet. I do not believe that you have to have a college degree to get hired — many people have gotten in here without one. As far as tech requirements go, you need a PC with Windows 7 or Vista at minimum. Doesn't look like they support Macs. This is an old, established company that has been hiring home-based workers for years. They are absolutely known for paying. The feedback from workers is so/so. Lots of people enjoy the work, but apparently they can be kind of strict when they do reviews on you and some people get suspended or let go without much warning. Go here to see the available Lionbridge jobs for your area. Good luck! Interested in other ways to earn money doing search evaluation? If you'd like more info, I highly recommend the e-book, Make Money From Home As a Google Rater, by Hanley Griffin. It is very inexpensive at just .99 cents and has 73 reviews on Amazon, most of which are 5-star. Hi! I tried to apply as internet ads assessor for Italy, but I was rejected after few hours.. What can I do to be accepted in the future? I am really interested.. I thought they would have decided after I took a test, but they rejected me just after reading my resume and my personal information.. I am frustrated, I really wanted to work for them.. I do know of a few reasons why they may reject people straight away (info I’ve picked up from other forums) but don’t know whether they’re relevant in your case. You need to have lived in your country of residence for at least 5 years. If not, they won’t even consider you. You need to have fluent English skills (looks like you have those!). It seems to be important to have degree-level education or equivalent. Not sure whether that’s a definite yes/no. It also seems to be important to attach your CV at the end of the application – even if you’ve already put all the info in your CV into the application form separately. I wasn’t sure whether to attach the CV as well, but in the end, I did so. I’ve read of people who didn’t do that and were rejected (although of course they may have been rejected for other reasons as well). Having worked for certain other similar companies e.g. LeapForce, Appen Butler Hill etc can also be an instant rejection. That’s probably not a full list – perhaps someone else has more suggestions. I’m not sure whether LionBridge will allow you to reapply straight away once they reject you, but you might have luck applying to one of the other companies I mentioned, who I think also employ people globally. Thanks for a detailed feedback about LionBridge. As mentioned about rejections do u advice not to mention working in other such companies in my CV. Please advice. I’m working for Lionbridge, but no tasks are available to rate. It’s been this way the last few days. Never had a shortage of tasks before. Has anyone had luck? I’m in the same situation. I got an email from them today though explaining the lack of tasks and it looks like the situation will be resolved soon – sounds as if there’ll be enough work to go round when that happens! Hi. Could you elaborate what they said was the problem and the time frame? There are a lot of concerned people out here and if the season is internsl, like fixing systems, it would eliminate a lot of stress. I’m on the Ads5 job with Lionbridge, so can only comment on task availability for that job. The issue was that the client hadn’t established a pipeline of data and instead was just uploading a few (VERY few) tasks to the tool each morning, and obviously nobody could get their hours – the number of tasks uploaded was barely enough for one person to get minimum hours, let alone a team. The email the other day explained this and said LB were confident the pipeline would be established ‘soon’. Indeed it was. Large amounts of data started coming through for that task on Friday (in time to get at least minimum hours for the week, hurrah!) and are still doing g so. I have no idea whether any outages in data for any other LB jobs are down to a similar issue, I’m afraid. When I used to work in the Tech Industry as a Consultant to Microsoft, Lionbridge was a major provider for Software Localization and Software Testing. They are a legit company. Hi from Italy. Me too I’m waiting for next week exam process. Do you think I shall have my exam in english? I’ve been working for Lionbridge for almost a year now and think it’s an awesome work from home job. It’s extremely flexible which is what I was looking for. Also, I wanted to point out that I use a Mac and I’m able to perform the Internet Assesor job. If I’m not mistaken, when I was looking at the different positions to apply to, they specified if the position required Windows only. Every time I look at current Job openings they all say have to have a smartphone . I already took the exam and retake it. Still failed. I’ve spent around 4 days. You have to be committed because it doesn’t pay when you reading the exam material. Reading all of it would take days, especially if it’s not your native language. The deadline sounds ridiculous in my opinion. I think the payment per hour also depends on your location. I think it’s not fair too and making you feel dissapointed too. Considering you work the same amount with others in a rich country only to get a lower salary because of your country. I agree. My 1st test actually never ended. I contacted their support and was told I only had 3 questions left. I finished the next page and the test only continued. Studying was a huge waste of time. I would NOT recommend this job. Their support is also extremely slow to email back and don’t email at all on the weekend, which cuts time out to take the test. You’re right the deadline is SHORT for a lot of reading. I applied for Lionbridge a couple of weeks ago. I went through all the long drawn out process of reading this and signing that. I was accepted in the “Exam Process”. I had a simple question about how they pay. Since I had been unemployed for the past year and a half I had no bank account so I applied for a RushCard which is on the way to me and allows direct deposit. Because of this (having no bank account), I have been taken out of the exam for tomorrow. Really? Is it THAT serious? You can’t direct deposit to a RushCard? A previous employer had no problem with direct deposit our paychecks to this type of card. I honestly do not understand the problem but I guess I might be avoiding a lot of aggravation by not being allowed to take an exam because of a bank account. They they don’t do direct deposit. They pay as wire transfer to a bank only which is why you need a bank account. Lionbridge are another example of an employer that exploits the labour market and the desperation of unemployed people. They will get you to train yourself in your own time at your expense! You’ll learn a skill that will be of little use to anybody other than Lionbridge! It will take you MANY MANY hours to acquire the skill. It’s all a bit of a con really. You’ll have to jump through a hell of a lot of hoops before you’ve even earned a penny. They should pay people while they are training. Hi guys! I’m interested in doing this type of work. Many of you have mentioned Workforce Logic. I’ve done some research and it looks like they are now called Zero Chaos. I’ve found that they have these types of positions and pay $15 weekly. Any tips those of you that have worked with Zero Chaos can give to help me land a job through them and what the process is like? How did you find out about the position? I’m new here. I applied to London Bridge last Thursday and today I received an email they were requesting more information (I used it to box instead of my home address because I was wary). I applied for the position of Web Assessor but when they wrote me back they referenced that I was being considered for the position of Side by Side Judge. I have no idea what that is and can’t find any information about it. Can anyone who was familiar with this position give me some more details? Hi Eden! I’ve been with LB for over a year now. SBS basically means you are given two pages of search results and have to decide whether they’re equally useful to web users or if one of them would be better to use. It’s actually one of their more enjoyable activities because it is easy to see how SBS work impacts the user experiences of everyone who has internet access. I applied for SBS Judge work and did some practice hits for 4-5 hours with quite a few wrong answers. I am just wondering if we need to click on each and every link on both the pages of search results. Since I am new to this kind of work, I am taking bit of time to understand the guidelines. Since you are with LB doing SBS judging, I appreciate some help with useful tips to understand in depth and do it faster. my email id is sowmyajayasankar@gmail.com . Also if you have any suggestions for me on this. My final exam hits is on 8th September 2016. Thanks heaps in advance. I’m wondering if anyone has experience applying for and/or working as a Social Media Internet Assessor for Lionbridge. I applied last week or so and today I received an email with the consulting agreement and other forms I need to sign before being given access to the exam. From what I read here, the exam sounds pretty daunting and time consuming. My email doesn’t say anything about the exam being specific to the social media position, so it might be the same exam as the regular Internet Assessor position. Does anyone have any advice on the exam and how to pass it? I would hate to waste a week studying for it and not passing. Also, this position says it’s $13.50 hourly with the 10hrs a week minimum and 20 maximum. From other research I’ve read on Lionbridge, how can you fulfill those hours if the work flow is low? And how do they keep track of your hours? Does this mean that regardless of the amount of work available, I can be guaranteed pay for at least 10 hours of work a week? That may be wishful thinking, I know haha. Anyway, just a little weary about this whole process since it’s my first time. I know this post is from a while ago, but I was also told the live roster is full. It’s frustrating! Did you ever end up working on live data? If so, how long did you have to wait? Thanks! I just started with iSoftstone and wanted to know if anyone knows when EXACTLY you are paid in the month? I know they pay monthly, I just would like to know when I should expect pay? I used to work for LF and they paid monthly, and pay was received by the 20th of the following month. Hi all! I am currently working for Lionbridge as a Speller Judge. I was offered this position 4 years ago when it was actual employment but was reinstated after it became contract work. It was a great employment position, but is very lacking as a contract job. I was told at the time that I “did not qualify” for the Web Content Assessor position but was never told why. I worked as an ads quality rater for WFL (was very good) but was let go because of their temp work policy. Never hired back even though I was told to reapply after a certain amount of months. For the Ads Quality Rater (Web Content Assessor) you can work up to 20 hours a week, with a minimum of 10 and if there is no work, you have no way of working up to the maximum for the week or the month. That is where the “earn up to 30 hours that month to be paid by the 10th of next month” comes in. There is not always work so that is taken into consideration when pay time rolls around. My husband worked for them for several months but didn’t really have the knack for rating. He was in his first year of college so although they ask for a degree, if you present yourself well, you may be accepted into the program. To offer some insight on pay, the amount of pay may be based on how many queries you complete but it is broken down into hours. For instance if 100 queries are considered an hours worth of work, if you complete 150 in one hour, you have worked for an hour and a half. Or if 50 queries are an hour, completing 100 in an hour means you completed 2 hours by their standards. Keep a tally of your queries and a timer running to know how fast or slow you are going. Paymo offers a free time tracking widget that is great for that. With Speller you can work up to 20 hours per week, sometimes only 10 hours per week. There is a test like Web Content Assessing but the material is different and some may prefer this position since the guidelines are much more cut and dry. There is a lot less confusion as to why this should be rated this way or that way. You are working on one type of task and that is it, so it can become a bit blah, but I actually really like blah. No surprises keep me from forgetting what I need to know to do the work. As mentioned above, Crowdsourcing is very tedious and yes, some of the work on there is similar to what is offered for higher pay, but the idea is that you can choose from much more content. It is not exactly the same though as the guidelines are not nearly as extensive as Speller or Web Content Assessor but time consuming enough to warrant higher pay. ( I crowdsource for another company). It is very low pay for a lot of work but if you like variety and have the time to do something on the side while working on something else, it is a good source of extra money. You can get kicked for working too quickly, getting too many wrong, failing to complete tasks etc. so may find yourself jumping around trying to find enough work to earn money on this one. In all cases, communication can be wonky. Email after email may be ignored simply because of the volume of emails the program administrators receive. Replying to the email they sent you may result in it going back into the pool of emails so try changing the subject line (add something at the end of the initial subject line) when you reply or send a different email to the address. I have a feeling a lot of their emails are batched. I have worked with them for 5 years now and never receive replies unless I do either of these things. Also, make sure you are clear about what you need and who you are. If you are given an ID or temporary username add this to the email to get a clear response because there are may be a number of people responding from the same company email address. It can be hard not to depend on this work for your source of income considering that is the whole point of working for any company, but you should always have at least 3 eggs in your basket. I have had to requalify for Speller and it took 3 weeks (Not me. Them.) then I had to wait another week to be reinstated. Yeah, a month of work down the drain. The reason I had to requalify was also pretty annoying but cannot discuss that or I may be axed. 🙂 The range above for pay is fairly accurate across the board. Even though I have other work on the side, I am still making up for the loss of income because I always worked the maximum hours allowed. You will not be able to work for two companies offering a similar position. It interferes with the confidentiality agreement because most of these companies are working on similar projects from different contracts. Each project within the company may even be different e.g. the projects may the same but from different competitors. (like working for Lowe’s and Home Depot) Even if they are working on the same contract, they would be working against another company on the same contract which is usually a no no. Perhaps this is why some people are hired on easily at other companies offering the same position but not on others. I was able to take the Ads Quality Rater test for Appen Butler Hill but missed it by that much, so I am almost sure that this is the case. But, since Speller and Assessor are different you can have these two jobs from different companies or anything along that line. On that note, apply for EVERYTHING! Make it your choice which one you work for. I prefer Lionbridge, but Appen is very good about communication. One may offer more money, but the other may offer more hours. One may offer bonuses while the other is cut and dry on pay. One may offer early payout, while the other pays at the end of the month after working for two months. Had I known this, I never would have worked for WFL , because I may have been able to stay on a lot longer with Lionbridge which offered bonuses for the type of levels I reached with WFL for a straight salary (sister also worked for Lionbridge). I am trying with iSoftStone right now (Ads Quality Rater) and they are a bit off with communication and slow with the test but they are very new so may be easier to get on with then the ones who have a history with each other. Good Luck Everybody! Hope this information helps. I am glad you have had such a good experience however I don’t agree with constantly having to go after this or any other company for a job. If you submit an application and resume and they say they will get in touch with you then they should without having to go after them and beg for the job. I need work however I don’t need it that badly to stoop to begging. In my opinion companies should stick to their word. Just my two cents worth! I applied with them 3 weeks ago and the application says it’s still processing. I’m not sure what to think of this opportunity. I knew I would have to wait but to wait this long…..hmmmm Maybe it’s just not meant to be but there are other fish in the sea as the saying goes. I applied to Lionbridge last month and have not heard anything back. I am frustrated and need to work from home. I have a disability, but in the eyes of the government, I am able to work a normal job. I would appreciate any contact back from the company. I am wondering if anyone else has been waiting as I have? Would be glad to know if there are search engine evaluation site that accept non-US residents ? Hi! I have recently been “hired” by Lionbridge as a Webcontent Assessor for the Austrian Market. As many people have stated it was very difficult to get in – a lot of study material to go through in your free time, a lot of “trial tasks” and their explanations as to why a homepage is to be rated in a certain way are not always logical. The thing that was most difficult is probably the fact that they supply you with the guidelines and everything in english language, but there is not an equivalent for everything in Austria. Anyhow – while I was training for the last exam, which I passed on the 2nd try, speed was never a matter. But as soon I was supplied with live data, I got warnings that I was too slow – apparently I should have been rating around 100 Pages per hour! So after a few hours I got dismissed from the task and now I am asked to requalify. As you can imagine I am rather annoyed at this and I can’t imagine I will ever be able to get up to that speed! Does anybody have similar experiences?? I’ve been working since the beginning of September as an Internet Crowd Worker and so far all I can say about is, “meh”. Of all the different jobs listed in this article, I have the option to do all of them, at different prices per task, if I study hard for them and then pass the qualification test. I don’t get paid an hourly rate, I get paid per task, many of them being 2 cents each, and it can take around 30 seconds or more to complete each task. You do the math, and don’t forget you have to hold taxes out on that yourself. I think my time is more valuable then what I am averaging out per hour with Lionbridge, almost slave labor wages. I can get more money working at Textbroker, and for people that know about Textbroker, you really don’t get much money there. The work is more stressful then I thought it was going to be, and there is a lot of studying you have to do for each task that you do not get paid for, and frankly the study material is very time consuming and can be somewhat vague so that when you go to take the qualification exam for that particular task, you are not always going to pass. Another thing that really bugs me is that there is no feedback if you get something wrong, you are just kicked off a task saying that you can’t judge it anymore. If they gave feedback saying something like, “that wasn’t correct, this is what we are looking for in answers for this task…”, that would go a long way with helping people improve, work more quickly, and boost general moral. When you are told you’re doing something wrong but not told WHY it is wrong, or WHICH ones you did wrong, what’s the point? 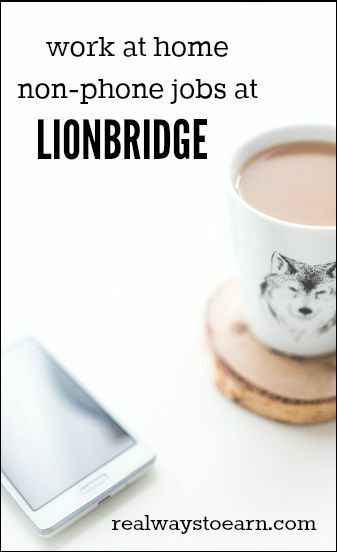 Another thing I have noticed from researching other peoples experience working with Lionbridge, a lot of the tasks I do are exactly what ones are doing that were hired on a hourly wage. So I’m basically doing the same work as hourly workers, but at a very drastic pay difference. I wonder if that is the future of Lionbridge, to hire people as Internet Crowd Workers doing the same tasks as former hourly pay employees, but at a deep discount to them. IDK, I’m not really impressed with this job, I don’t think it is for me. I will continue to do it for now, but I don’t see this lasting until the end of the year. I did my test last week and failed twice after about a month and a half of studying the materials.I did not like it at all,the experience was mind crushing and i felt many of the answer i got wrong were in fact correct. Heather, I’m sorry things aren’t going so smoothly. It’s amazing to see how different people can get such different results from the same company. I know you said rating may not be for you but have you tried applying for the other places, like BH, WFL and LF? You might have a better experience with one of those. It’s been years since I’ve worked for WFL so I can’t comment on what they’re like now but I didn’t have any issues, back then. Heather, your post had some good insight in it. Fortunately not everyone will run into the issues that you experienced. As many of us have discovered, there are many variables from one position to another with LB and sometimes even two people working the same position have different experiences. I know you were speaking from the experience of applying to be a web content assessor and it seems that none of their positions are handled exactly the same way. For example, all of my webinars and communications are PST, so responses are usually very timely. Not all positions receive a bonus for passing training, nor a bonus for working 70 hours in a week. Most of the positions are paid by the hour, not by the task and most people seem to think the hourly rate is quite fair. I’ve seen a few people who were downright giddy about it. Rating, in general, can be very subjective but after you’ve worked there for awhile, you come to understand the way they see things and you’re able to conform to their way of thinking. Soon it becomes second nature. Also, once hired, they usually ask you if you’re ok viewing adult subject matter or wish to opt out. Anyway, they have a lot of different positions and if what you’ve seen while training turns you off to that one, I would suggest applying for another. I’ve seen people do it and were happy that they did. Good luck. Thank you very much for the additional insight, Brette. Thank you for the feedback. At this point, I am assuming that I am no longer a candidate. I received zero response when I requested more practice queries, which they stated I must complete (hard to do when they do not exist). Anyhow, I do not like that LB failed to respond on any level. It is a poor business tactic to ignore potential workers or business contacts especially when they are corresponding in a professional manner. Therefore, I am not certain applying for a different position is the best choice for me. The first impression is an important one, and I have discontent with LB failing to maintain a professional relationship. Although it sounds as if other folks do like his or her employment with LB, I feel a little jilted. Thank you again, Brette, I appreciate your post. I received a response immediately after I applied and submitted my resume. However, the communication is lacking a bit. The qualification process is not easy. They require you to read a vast amount of data that is disorganized. It would be helpful if a talented technical writer could correct that situation for Lionbridge. Also, they communicate via European time zoning so the responses are not timely and the webinars are offered BST. Additionally, they give you a limited period to complete everything. You will spend a full week tackling the information, the practice data (200 queries completed), and final exam (must pre-qualify to take exam). They do offer some bonus incentives. Presently, the company is offering a $150.00 bonus if you work 70hrs in four weeks. They also offer a $150.00 bonus for passing the exam. But the training is many hours that you are not paid for. In addition, the work is not paid by the hour but by the tasks that you complete. This could alter your pay rate. In addition to that, Lionbridge offers different positions, and the one that I applied for was the web content assessor. It basically entails search engine queries and the desired landing page result. Some queries do take you to horrific results (inappropriate), and they can expose your computer to viruses, trojans, and other nasty things. My short-term memory is still suffering from a heinous image that I viewed, which I quickly labeled as detrimental. Plus, I find the rationale for many of the practice data queries to be inefficient thus incorrect. I did appeal about half of them. So be forewarned that you may find frustration in agreeing with the web content assessing (subjective) opinions that they present as a correct response. I know I have! Overall, I am not sure this is the correct position for me because I found many of the query results they offered to be illogical. There is much to be said about subjectivity. I will let you know if I make the cut. Right now, I have completed a little less than 100 queries in the practice area. However, I do not have any more queries available to me; thus, I am uncertain how I will be able to satisfy the 200 query requirement. Again, there is a disconnect within the company in providing accurate assistance and data to succeed. Whelp, I hope this post helps others that are considering applying. Thanks so much, Heather. I’m sure it will help! I appreciate all the information you shared. I’d like to ask, Can i work both two companies? I was working ABH (Appen butler hill) right now and I would like to try working also in Lionbridge? is there any consequence for that? I’m not sure, Peter. But you could try applying and see what happens. The only way to get hired with them if you worked for WFL is to use a totally different email address then what you had at WFL and then also not disclose that you actually worked for them also. The ones who work at both usually started with Lionbridge first and then while working there or after then applied at WFL. It used to be the same way with Leapforce but they don’t enforce it as much anymore. Usually if you have a year or more of not working from WFL and are not there currently they hire. But not always. If you say yes to recently applying to them as well as being a past worker they will deny. Most people now just say they didn’t work for any other search eval companies and remove it from their resume. Since you were an independent contractor there is no way for them to verify employment since you were never employed. You were contracted. Some people have an issue about doing this others do not. So it would be a decision you would have to make and be able to live with. Thanks, Bernice, that’s very interesting and helpful information. As far as being an independent contractor goes, WFL hires its evaluators as employees, so I don’t know how easy it would be to deny working there. But thanks for your insight – I see now that I was going about it the wrong way, since I was making a point of emphasizing my assessing experience rather than downplaying it. Do you know if Butler Hill has the same policy? That’s not true, though. I did 2 years with WFL and went almost straight from there to working for Lionbridge. Not only did I use the same email address but my WFL experience is on my resume. It’s obviously up to the person whether or not they want to disclose but it’s not reasons for an automatic denial. Thanks, Brette. Did you do this switch fairly recently? I noticed that Anna said Lionbridge has changed a lot. Actually Kathy, my switch wasn’t recent at all. I’ve been with them for 5 years. However, a couple of months ago, LB asked me for referrals. I gave referrals to several people and 3 of them were hired. One of them used to work for WFL and she decided to include that fact on her resume. There are plenty of people who’ve applied and never heard back from LB and they’ve never worked for WFL. So just because you have worked for WFL and haven’t heard anything back doesn’t necessarily mean that is the reason. Do you know if Lionbridge hires people from California? I haven’t heard that they don’t, Becky. You should definitely apply and see what happens. Good luck! Kathy, I’m in the same boat you are. I also worked for Workforce, then found that every time I applied for Lionbridge, I was near automatically rejected. My contract with Workforce ended nearly a year ago, and I reapplied last fall, so I doubt I’ll ever work for them again. Thanks, Markato, for your comment. You would think that they would want experienced assessors, even if their evaluation methods are somewhat different from WFL. I think you hit the nail on the head with the word “automatically”; it feels like their program kicks me out once I answer “yes” to the question about working for other evaluation companies. Or could it be just because I worked for WFL? I wonder if the same thing happens with former Leapforce employees. I had always heard the rumor that there was some sort of agreement between WFL and Lionbridge, but I’m not sure if it’s actually true. It would be interesting to see input from others who have worked for different companies. I recently applied to them and was awaiting instructions on the qualification process. They told me in 24-48 hours I should hear back from them, it has now been 6 days and i have not received any word from them as of yet. I wrote back to them because maybe they forgot about me. Has anyone had this issue before? I work for Lionbridge and so far it has been a positive experience. The schedule is flexible and the pay is good for a work from home type job. Only downside is that is can be a little boring and repetitive. Do you know if Lionbridge does not hire people who worked for other search engine evaluators? I used to work for Workforce Logic and Lionbridge keeps rejecting my applications immediately and does not give me any reason. I’m pretty sure that I am otherwise qualified for most of their jobs. This is something I’ve heard before, Kathy, but never been quite sure about. I think I’ve seen some people say that they’ve worked for multiple search engine evaluation companies with no issues and others say they can’t get in since they previously held a similar job with another company. Maybe someone who knows for sure will chime in with some more info. I just finished my one year assignment with ZeroChaos, and right after I applied to Lionbridge, they rejected my application. They didn’t even bother to send me an e-mail; I logged in to my personal account with them, and saw the rejected status. No given reason whatsoever, but I’m pretty sure it is because of my previous experience. I’m bilingual, so we usually have better chances to get in, but not in this case. Their selection criteria seems quite arbitrary to me, and definitely lacks some professionalism. According to my experience, ZeroChaos seems to be a much better company for this type of work. Their selection process/criteria is much more transparent, and even more rigorous -although we are employees, not contractors-. Unfortunately, the chances of being rehired after the 90 day waiting period seem a bit slim and not guaranteed. Good luck to all. That confused me, too. But looking at it closer, I think I need to re-word it. The job listing says “up to 20 hours per week” so maybe you can’t work more than that. I did see on the forums where people said the day you are paid depends on whether or not you got in at least 30 hours in the month. So I bet it is more flexible than that. Thanks for pointing that out! Would you mind sharing which position you applied for specifically? I’ve worked on the Speller team for a few years and it’s not bad when there’s lots of work, though it takes weeks to hear anything when it comes to support. Work has been very slow lately so I’m thinking of applying for a different position with them, I just hope it’s not the one you’re talking about.